at all but about one of the most entertaining people ever to prepare it. That would be Julia Child, about whom I’ve expressed my admiration before. I’m not sure if you’re following what is going on with her estate and the Thermador people but it instructive on a number of levels. Well, you say, sounds like a typical celebrity endorsement. As we all know the notion is that people who like the celebrity will like the product the celebrity likes too. There’s only problem. Julia Child NEVER endorsed products. Nothing. She always felt she was a teacher, and anything that wasn’t of the highest quality could undermine her reputation. The foundation that owns her intellectual property has sued since they were never approached in advance of the use and turned down a license when they were since they won’t license her name or image for endorsements. Pretty straightforward so far. Right. It’s a statement of fact. So if an athlete is photographed drinking a Coke, it’s fine if Coke uses that statement of fact in an ad. I don’t think so. More importantly, to those of us who admire Julia, this is having exactly the opposite effect as an endorsement. You can’t force people to endorse your products, you can’t use their likeness without permission, and you can’t rationalize your way into it being OK. This is a good lesson on why bad behavior seldom works out in business. I can’t imagine anyone who has ever done anything in marketing wouldn’t have known that this is wrong. Thermador, I use your products and like them – feel free to use that endorsement. But stop behaving badly, please. You’re better than this, or at least your ovens are. and was standing talking to some other folks on the team when something with started dripping down my sport coat. Despite it being a warm morning I was very certain it wasn’t sweat. What I was hoping was that it was some excess moisture dripping off a pipe but of course it wasn’t. It was bird poop. Well more specifically I think it was bird pee although frankly it doesn’t much matter. As I was standing there frantically trying to wipe it off my coat, my compatriots informed me that it was good luck. Apparently in some cultures a bird pooping on you is exactly that. I’m not so sure it is in my culture – more likely it’s 180 degrees from that. In checking out their notion I also found that many people believe this to be a major sign of wealth coming from heaven. Seem to me it’s a sign of an expensive cleaning bill coming. In any event it did trigger a business thought. 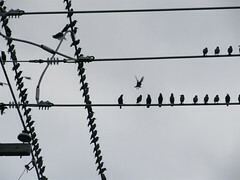 Too many businesses spend their time standing under wires hoping bird will poop on them, figuratively speaking. They would almost rather be lucky than good. Rather than looking for wires filled with birds, they’d be way better off spending time looking at analytics, social mentions, and their own financial statements. Spending money on bird seed trying to attract the birds and the luck they bring is probably not as worthwhile as spending it on an all hands on deck brainstorm. You know the ones – where no idea is a bad one and outrageous thinking is encouraged. I’ll let you all know if some great piece of luck follows – there wasn’t a large check in the mail today however. In the meantime, remember what Hemingway told his son – you make your own luck. Good business advice – and much cleaner than depending on the birds! You Carry A Tamagotchi, Honestly. Anyone remember the Tamagotchi? 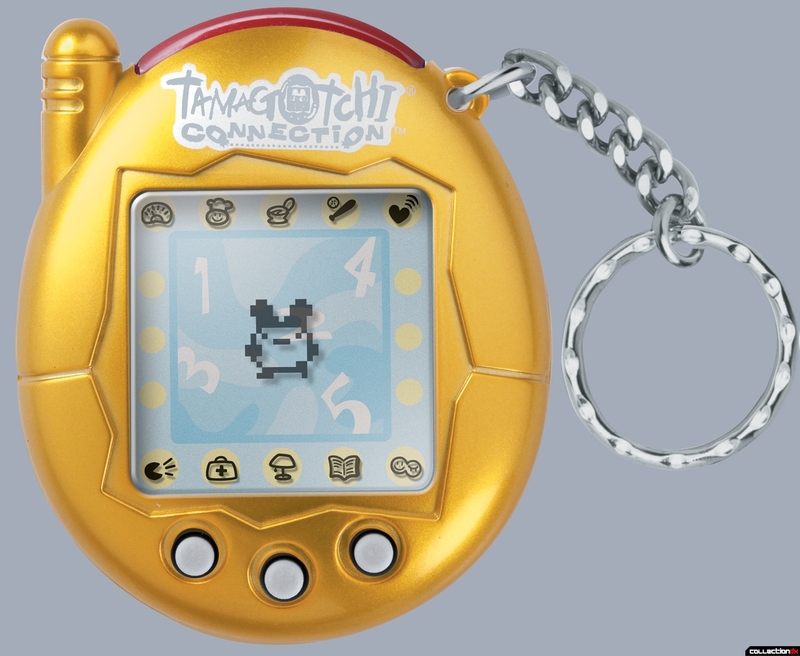 They were a late 1990’s phenomenon – digital handheld pets. The owner had to care for them on a daily – maybe even hourly – basis or they’d die. Not a fun experience for either the owner (generally a child) or the parent. I was reminded of the constant care and feeding required by those things this morning as I booted up my phone and found nearly a dozen app updates that needed to be installed. That, of course, was after I updated a half-dozen yesterday. Don’t get me wrong – some of the updates contained wonderful enhancements to the app and were very welcome but way too many were either bug or security fixes. In fact, if you own a smartphone, notice how often you get an update followed within a day or two by another. Having worked on a few mobile apps, I know how hard it can be to catch everything in QC. We’re not going to have the Android vs. iOS chat now but even in a closed system like iOS there are multiple versions in multiple devices and the updates come fast and furious. Using the mobile web and web apps is better although various browser/hardware/OS issues still make testing hard. At least the user doesn’t have to do any updating though. The real issue for me is that I’m not sure there’s enough thought or care given to the constant update issue. Some apps will do a partial release – they think if a button was bigger it would get better results so they push an update to some of their users to test it. Other apps decide to change the permissions (to get more of them and more data) on their installed base knowing that most people don’t look at that when they install the update. Still others move features behind a pay wall. Obviously security issues need to be fixed immediately, but a logo change can certainly wait until a big release, right? Way back when in the early web days the dream was for a universal browser looking a web sites – no client side activity at all. Now in mobile it’s gone back the other way – dedicated client-side apps have replaced the server activity. Maybe it’s that apps are a closed world – I’m not shopping Barnes & Noble while I’m in Amazon’s app. But there’s got to be something other than grown-up Tamagotchi worlds living on our smartphones. You might have read or heard about the Twitter brouhaha last week. No, not another politician sending pictures of his undies. Twitter announced that they are going to restrict the use of their API and due to that a bunch of companies are going to have big problems. While I realize that this entire discussion might be a bit of inside baseball for you non-tech business folks, I think the decision Twitter made is instructive no matter what business you’re in. Basically, Twitter announced a bunch of restrictions on the number of times an application can access the Twitter stream. You can read the details on Twitters developer blog but suffice it to say that anyone who makes a traditional Twitter client – Storify, Echofone, TweetBot, etc. – is going to have some issues. These folks compete with Twitter’s own app (both the regular Twitter client and TweetDeck, which they own) for ad dollars and part of what Twitter announced was the division of the Twitter world into four quadrants. One of those is “consumer engagement” and while Twitter is trying to encourage competition and business building for analytics and B2B, it wants to ” limit certain use cases that occupy the upper-right quadrant.” In other words, restrict anything that interferes with their ad-supported business model. I understand why Twitter is doing this. After all, it’s their data (even if the users are creating the content). However, I think they’ve got it backwards. Rather than protecting themselves in a very difficult, competitive area (ad sales), maybe they should have focused their revenue efforts on the folks who are making money themselves (the analytics and other B2B guys). They’re saying they welcome development on their platform as long as it avoids their core revenue model, which is consumer experience enhanced with advertisements. In my mind, setting up a bigger toll booth in front of the folks who remarket the data for large fees makes more sense. It’s the Willie Sutton rule – go where the money is. Twitter has no competition when it comes to the folks using their data to drive their product while there is plenty of competition in the ad world – Twitter isn’t yet a “must” buy. That sort of decision-making comes up in many businesses from time to time and I think a long look at what Twitter chose is instructive. What do you think? A 15 year old young woman won the CN Canadian Women’s Open over the weekend. Lydia Ko can’t drive cars but she certainly showed she could drive into the middle of fairways as she beat the best women professionals on the planet. She’s not yet one of them – she has retained her amateur status because she thinks she might want to play collegiate golf. That’s a $300,000 decision but one would think she’ll have many years in which to earn that back and a lot more. This isn’t a total shock – she is the current U.S. Women’s Amateur Champion but she did beat a strong professional field so it’s very unexpected. Q. Lydia, you’re 15 years old. You’ve just beaten the best players in the world. Has it sunk in what you’ve just accomplished, and was there ever a point on the Back 9 where you’re looking around going what the hell is going on here? LYDIA KO: (Laughs). I don’t know. Like the first time I looked at the leaderboard was on I think 17 or something. Maybe I had a peek or anything. But I kind of looked at it because I wanted to become more relaxed, and today I said I’ve got nothing to lose. I already got the leading amateur in my bag. And yeah, all I need to do is play my game, and my goal was 4 under, so I shot 5 under, even better. In other words, she was fearless. Her attitude was “I’m a kid, I’m not supposed to win, I’ve already accomplished a lot by winning the Amateur, I’m learning a lot just by participating so why worry.” How would each of us perform at our jobs if we kept that perspective rather than getting so caught up in the moment or current crisis? That’s my thought to start the week – you with me? Our Foodie Friday Fun this week is pasta. I’ve expressed my love of Italian food on many episodes of the screed and there’s nothing more Italian than macaroni. There are dozens of shapes and types . Long noodles, short noodles, extruded shapes, rolled shapes. Most are associated with a particular region and the type of sauce dictates the type of pasta. My personal favorite are the Strozzapreti – the Priest Stranglers of Roman cuisine. Walking into a fresh pasta store in Italy is a mind-blowing experience. There are so many choices and what isn’t available can be made for you using the array of dies they have. Yet the basic building blocks are very simple – flour, eggs, maybe some oil, maybe some water. There are add-ins like spinach and squid ink but the basic as always the same. What does this have to do with your business? First, many of us get frustrated in our attempts to “be different.” We tend to focus on being radically different when the reality is that the basic ingredients are, in many cases, the same. The little alterations – a pinch of salt, the cheese used in the filling – are what separates good from great and the same old same old from the fresh. If you change things up too much, like badly made pasta it falls apart. So what are the basic business ingredients? The same ones we discuss all the time around here. A plan, an open mind, a focus on facts, a great team, and an ability to listen to everyone – customers, markets, and staff. Like flour and eggs, dozens of outcomes are possible depending on the circumstances. We determine which pasta to make base on the sauce we’re creating – delicate noodles with delicate sauces, ridged pasta to catch the sauce. In business we need to think about the sauce – the market – as we consider the pasta – your business. If your business was a pasta, which one and why? Something to ponder! We all like to believe that we’re smart. I always used to ask that as an interview question of potential employees – “are you smart?” No one ever said they weren’t and I certainly wouldn’t have expected them to. Me? I sometimes feel as if I’m not the smartest guy in the room even when I’m alone. When people seek to impress others, they often do so by highlighting individual achievements. Despite the intuitive appeal of this strategy, we demonstrate that people often prefer potential rather than achievement when evaluating others. Indeed, compared with references to achievement (e.g., “this person has won an award for his work”), references to potential (e.g., “this person could win an award for his work”) appear to stimulate greater interest and processing, which can translate into more favorable reactions. This tendency creates a phenomenon whereby the potential to be good at something can be preferred over actually being good at that very same thing. In other words, we much prefer hearing job candidates talk about how they are empty vessels capable of greatness than about how many deals they’ve closed. I think that’s why I used to ask the “smart” question – it gets to a candidate’s potential. The thing is that the raw intelligence – the potential – has to be married to a respect for the intelligence of those around you. No matter how smart you may be, you need to seek out people smarter than you are to keep yourself growing. If you can’t find an individual, the odds are that the collective wisdom of co-workers and peers can serve the same purpose.